The first thing you’ll notice when you get your hands on the Nintendo’s next game console is its length – the Wii U is undoubtedly Nintendo’s longest video game console yet. The Wii U is basically a souped-up version of the original Wii which changed the face of gaming by targeting a broader demographic catering to people of all ages. The Wii has become one of the bestselling video game consoles of all time, surpassing the Xbox 360 in terms of sales figures in 2007, according to the Financial Times reports. About 26 million units of Wii were believed to be sold in 2009, which was the highest number till date. Despite having a slower processor and a poor graphics performance than its rivals, the Wii sales have touched new heights of popularity. In 2012, Nintendo released its next game console and the successor to the Wii – the Wii U. The Wii is a seventh generation video game console released by the Japanese video game company Nintendo in 2006 and a worthy successor to its previous console, GameCube. It managed to generate a great deal of love and nostalgia for what it did with the Wii, which was then touted as the future of gaming. It’s Nintendo’s one of the bestselling consoles of all time which even managed to surpass the sales of Microsoft’s Xbox 360. 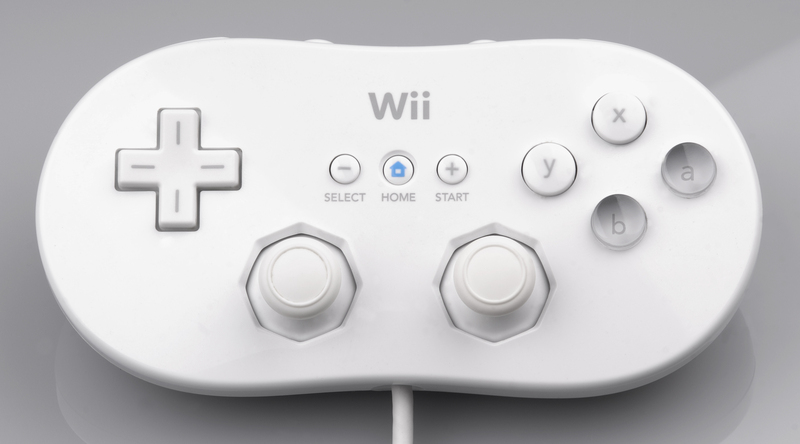 With Wii, Nintendo took gaming to the next level thanks to its interactive Wii remote (WiiMote) that can be attached to a joystick or other input devices, and some great attachments such as Wii Wheel and Nunchuk which allow more freedom with your hands. It also features the motion sensing technology for an interactive gaming experience which allows players to control the game by physical swings, gestures, and swipes. The remote keys into a wireless sensor which is attached to the console so that to track movements of the device rather than button presses. It also has built-in Wi-Fi so that you could connect to one of Nintendo’s special servers to enjoy playing with other Wii players. The Wii games are even more addictive offering options for all ages and abilities. What is Nintendo Wii U? The Wii U is the next-generation video game console and a worthy successor to the Wii released in 2012. It was the first eighth generation game console released by Nintendo and is a significant upgrade to the Wii. One look at the Wii U and you can see it’s definitely the longest game console yet, which is definitely one of the major changes in the Wii U. Apart from the noticeable changes, Wii U also incorporates some major upgrades such as the HD graphics support, additional USB 2.0 ports, and the Wii U GamePad, which incorporates a 6.2-inch LCD touchscreen, two analog sticks, a front-facing camera, motion control, stereo speakers, and what not. The GamePad is definitely the selling point of the Wii U and let’s not forget, it is an HD console. To take on its potential rivals Microsoft Xbox 360 and Sony PlayStation 3, Nintendo includes an HDMI cable with the Wii U right out of the box. The Wii was the seventh generation home video game console released by Nintendo in 2006 and an upgrade to its predecessor, GameCube. The Wii U is nothing but the souped-up version of the Wii and the first eighth-generation video game console. The center of attraction of the Wii is definitely the Wii Remote (also known as WiiMote), which is the primary controller of the device featuring motion sensing technology to make gaming more interactive than ever. The main selling point of the Wii U console is surely the GamePad which takes gaming to a whole new level. The GamePad in the Wii U bridges the traditional barriers between the player, game and TV by adding a second window to the gaming world by incorporating a 6.2-inch LCD touchscreen along with a front-facing camera, a microphone, stereo speakers, and a stylus to add to your gaming experience. The primary controller for the Wii is the WiiMote which is as interactive as it is sophisticated. The Wii U is the upgraded-version of the Wii which probably has been designed to address the limitations of the Wii. When it comes to design, the first major change you’ll notice in the Wii is that it’s a bit lengthy. Besides the length, Wii U has added two more USB 2.0 ports up front and the fan has moved about an inch to the right on the back to make space for the HDMI ouput. The Wii U is a powerful console and a worthy successor to the Wii, in terms of performance. The Wii U comes built-in with a much powerful 1.243GHz Triple-core PowerPC-based Espresso microprocessor. The Wii, on the other hand, was a 729MHz single core device with a Broadway microprocessor. The Wii had 88 MB system memory, whereas the Wii has a 2GB RAM with 1GB reserved for the operating system. The Wii contains 512 MB of internal flash memory with an additional SD card slot for external storage. 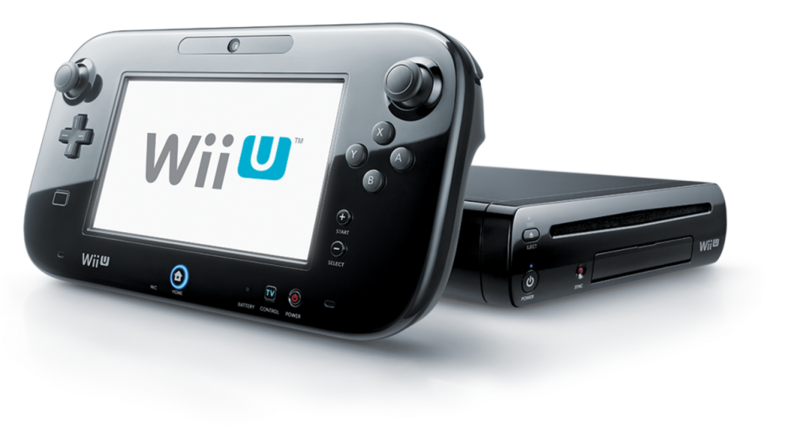 The Wii U comes in two variants – the 8GB Basic model and the 32 GB Deluxe model – with enough storage to store game data. The Nintendo’s Wii U is a souped-up version of the original Wii, which in fact was a successor to the previous game console, GameCube. Besides the length, which is a noticeable change in the Nintendo’s next-generation game console, the Wii U is much more powerful than its predecessor, plus it’s backward-compatible with Wii games, which is not possible with the Wii. The GamePad is the primary controller and the main selling point of the Wii U console, which includes a built-in LCD touchscreen to take gaming to the next level. And the best thing about the Wii U is that it’s the first video console to support HD. This article looks at the differences between the two consoles. Sagar Khillar. 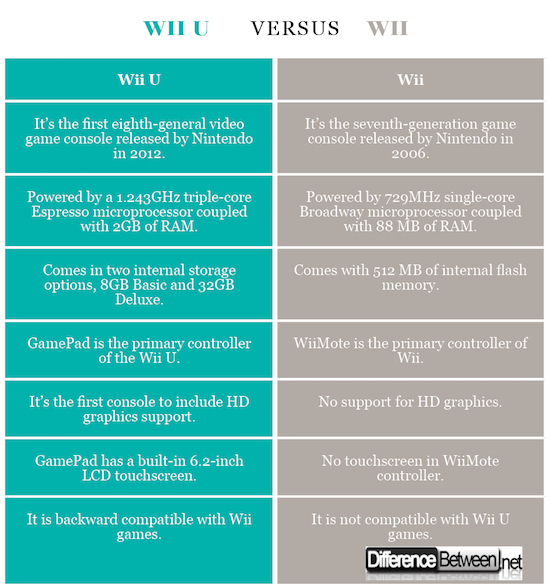 "Difference Between Nintendo Wii U and Wii." DifferenceBetween.net. May 31, 2018 < http://www.differencebetween.net/object/difference-between-nintendo-wii-u-and-wii/ >.